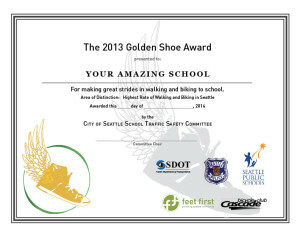 The City of Seattle School Traffic Safety Committee is happy to announce the winners of the 2013 Golden Shoe Award. This annual award is given to three Seattle schools that show distinction in promoting walking and/or biking to school. Broadview-Thomson K-8 School, with Principal Sarah Talbot, for showing the greatest sustained increase in walking and biking to school. For many years, Broadview-Thomson families have celebrated International Walk to School Day in October and have sustained several year-round Walking School Bus routes. Their efforts have paid off, raising their walk and bike average from 11.3% in 2007, to 17.2% in 2011, and to 27% in 2013! Dunlap Elementary School, with Principal Winifred Todd, for showing the highest overall rate of walking and biking in South Seattle. 30.3% of the students reported walking or biking to Dunlap, well over the national average of 13%. Head teacher Jackie Brown has been a driving force behind Dunlap’s Safe Routes to School effort for several years. In 2012, she worked with fifth grade teacher Nathan Kennedy to successfully apply for a minigrant from the Seattle Department of Transportation to increase bike safety education and improve student safety during arrival and departure times. The winners for 2014 winners will be honored at June 4th meeting of the Seattle School Board. The Golden Shoe is an award to celebrate safe, active, and healthy school transportation — in other words, getting to school by the power of your own two feet. Walking and biking to school have declined dramatically in the past forty years, corresponding with a rise in inactivity and related health problems among today’s youth, as well as an increase in traffic-related problems near schools. When the Seattle Schools adopted a neighborhood schools policy in 2009, one goal was to promote community building that would spring from having a large concentration of families living within their school walk boundaries. The District was aware of the probability, however, that the reduction in yellow bus service would lead to increased numbers of families driving — even short distances — to school. 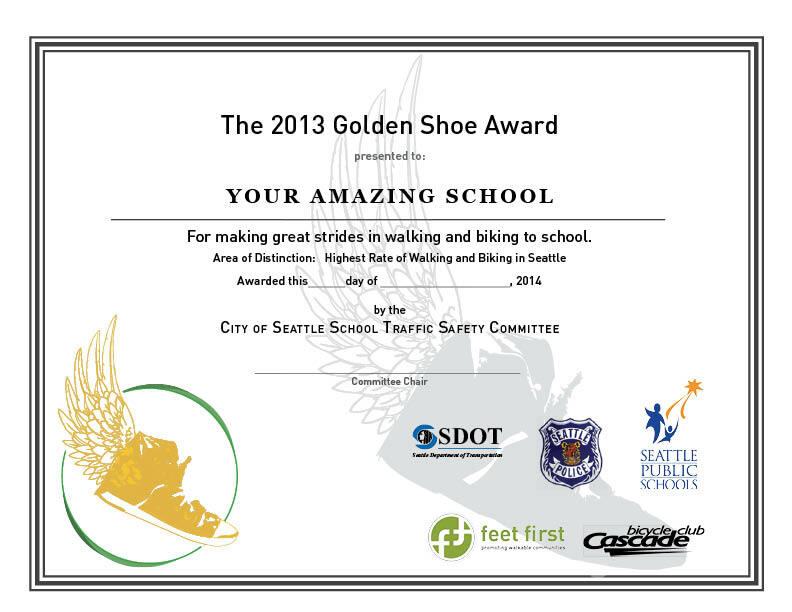 The Golden Shoe Award is one piece of a coordinated and developing effort to give schools more tools to encourage safe walking and biking to school, in this case by rewarding positive trends. How do schools qualify for the Golden Shoe Award? Every spring, the school transportation department coordinates a survey of student travel, known as the mode choice tally, in all elementary and K-8 schools district-wide. During the first week of June, classroom teachers ask students how they traveled to school and how they plan to leave school at the end of the day. The surveys are tallied and analyzed by the City of Seattle School Traffic Safety Committee, an inter-agency group that eventually chooses the winners of the Golden Shoe Award. In 2013, forty-four schools submitted tallies, providing the district with valuable information about numbers and trends in school travel. Adams, Alki, Beacon Hill, B.F. Day, Broadview-Thomson, Bryant, Dunlap, Emerson, Bailey Gatzert, John Hay, Kimball, Laurelhurst, Leschi, Lowell, Maple, North Beach, Pathfinder, Rainier View, Sacajawea, Stevens, Van Asselt, View Ridge, Viewlands, Wedgwood, Whittier, Pinehurst and TOPS. The next mode choice tally will be conducted during the first week of June, 2014. Seattle public school principals will receive information about how to conduct the tallies several weeks prior to this date. Any independent schools wishing to participate should contact Jen Cole at Feet First for more information. *Note that in 2013, the mode choice tally was conducted during the month of May, which is also Bike to School Month. In the future, the tally will be conducted during the first week of June to avoid confusion with that encouragement campaign.